Lordy Lord. Simon is sick. I mean, really, really sick. That green slime caking the under-regions of his schnoz is more than terrifying--and it's no wonder he has the entire school in a dither. The problem is, Simon doesn't care that he feels lousy. He's in for the best week ever because he LOVES school. Kissing the family good morning (and passing on his microbes), he throws up his breakfast on the bus, shares snacks with friends and sneezes like a paintball explosion all over his classmates. None of it really matters so long as he gets to go to school to play with his mates. 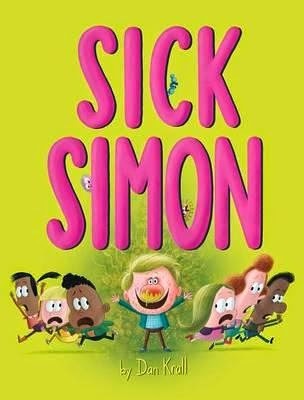 Of course, the entire school turns sick and eventually Simon no longer has any friends left to play with. Why? Because--and here's a novel concept--they're all at home taking care of themselves and getting better! On the bus ride home, Simon gets to meet some of the microbes that make people sick. They give him a real wake-up call about keeping healthy and preventing the spread of germs, even offering fail-safe ways to keep the sniffles at bay. Will Simon take the hint? This hilarious picture book, with a very clear message, manages to skirt around didactic and offer an educational bent that really works. Kids will not only learn about keeping sickness at bay, they'll have a brilliant time travelling along with this very funny young lad and his enthusiasm for his friends. Dan Krall's fabulous illustrations, as always, shine. Especially that gooey green gloop. A great book for schools.